Preheat the oven to 325 degrees and grease a 9 by 13 inch pan. Beat the eggs with sugar and oil for a good 5 minutes. Mix in the flour and ground almonds just until incorporated. Pour the batter into the prepared pan. Bake for 35-40 minutes or until a toothpick inserted into the center of the cake comes out clean. While the cake is in the oven make the syrup. In a small saucepan mix the water, rosewater and the remaining 2 tablespoons of sugar and bring the pan to a boil, then reduce it to a simmer. Let the syrup simmer for about 5 minutes. When you removed the cake from the oven, set it on a cooling rack and immediately pour the syrup over it. 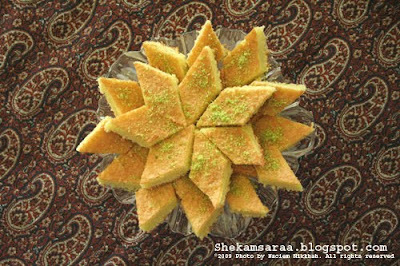 Let the cake cool completely, then cut it in diamond shapes and sprinkle it with the ground pistachios. تخم مرغ و شکر و روغن را مخلوط کرده برای مدت 5 دقیقه خوب بزنید. آرد گندم و آرد بادام را اضافه و فقط به قدری بزنید تا با مایه مخلوط شود. مایه را توی ظرف ریخته، توی فر به مدت 30 دقیقه بپزید.تا کیک حاضر بشه، شیره را آماده کنید. آب، گلاب و باقی شکر را توی یک قابلمه کوچک مخلوط و بگذارید برای مدت 5 دقیقه بجوشد. وقتی کیک آماده شد شیره را سریع روی آن بریزید و بگذارید خنک شود. سپش کیک را به شکل لوزی ببرید و روی آن پودر پسته بپاشید.